Everyone knows garlic as the ubiquitous kitchen seasoning that it is, but there are fewer people who realize that they can use this versatile bulb medicinally! One way to combine those two purposes is to make Garlic Infused Honey. 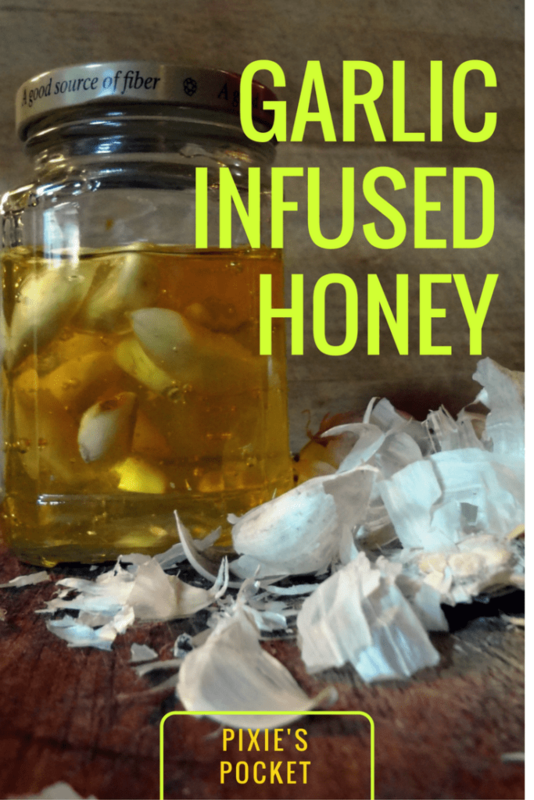 Why in the world would you want to infuse honey with garlic? At first the combination sounds odd when you compare it to the sweet, flowery flavors of honey. Trust me! The investment in a head of garlic, a cup or two of honey, and a little bit of time will be worth the end result. Imagine a drizzle of this flavor explosion over a bit of fresh chèvre, or used as part of a marinade. Pair it with butter and whip it into a delightful accompaniment to just about anything: biscuits, savory crepes stuffed with fresh veggies, or on corncobs fresh off of the grill. Culinary pleasures aside, garlic infused honey is a boon to have around in cough and cold season. The antibiotic and antiviral nature of garlic and the moisturizing honey makes this a delicious soothing syrup for coughs and sore throats. This is a project that I have intended to do for years now, but it was the recent post from Colleen at “Grow, Forage, Cook, Ferment” that reminded me to give it a go! She’s always an inspiration when my own kitchen creativity wanes. For more garlic-related food experiments, try my Lacto-Fermented Garlic Recipe. You can add garlic cloves whole, chop them, or smash them a bit. I used whole cloves this time around, but will try another method next time. Cover the garlic cloves with honey. Use a chopstick or butter knife to gently stir the garlic cloves, allowing air bubbles to escape. Add more honey if needed. Cover the jar with the lid, but don’t close it too tightly. The fermentation process will create gas that needs to escape. You’ll see bubbles appearing after a few days! Set the jar aside on a warm countertop or windowsill. Open the lid every few days to let the gas out. Every now and then, close it tightly and turn it upside down to re-mix the honey and garlic. You can let the honey infuse for as long as you like, but a month is a good average amount of time to wait. Once done, you can either store the honey with the cloves or strain the cloves out. Either way, store the finished honey in the fridge and make sure it is clearly labeled! After a few weeks of soaking up the sun in my kitchen window, I opened the garlic honey and gave it a taste. Delicious! If you feel a cold or flu coming on, try a spoonful of raw garlic and honey just on its own! If you prefer a less-punchy garlic experience, you can strain the cloves from the honey before you stick it in your fridge. If you do strain the cloves out, don’t throw them away! You can still use them in cooking, or you can dehydrate them. Here’s a neat technique from Well Preserved. I did something similar to their recipe, but I dried my cloves of garlic in my oven with some rosemary (from a rosemary infused honey!) and after about 8 hours or so, they were dry enough to grind in my Nutri-bullet along with some salt. Now I have a tongue-teasing condiment that ends up getting put on just about everything these days! If you don’t feel like chopping or peeling garlic with your usual method, try the jar technique! Take the whole head of garlic and toss it in a mason jar. Screw the lid on tightly and shake the jar for a few minutes. Just imagine the things that make you angry are all in that jar…now take out your frustrations by shaking the bejeezus out of that garlic! After a bit of effort, the cloves will be separated and peeled. Just pick them out and toss the garlic skins in the compost or save them for making broth. Thanks for reading, now go and give it a try! You won’t be sorry.